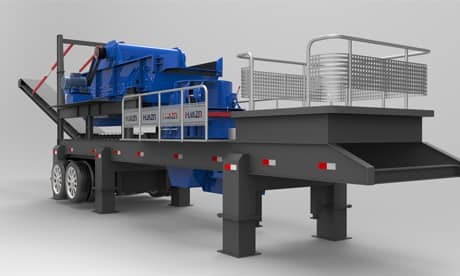 The mobile crushing machine mainframe adopts the unique design of heavy-duty super rotor, large-capacity crushing chamber, heavy counterattack plate, alloy high wear-resistant plate, hydraulic opening device, etc., which makes it have greater crushing capacity and crushing ratio, stable quality and low production cost. And easy to run and maintain. It can crush ore and rock with medium and low hardness. The broken product is in the form of a cube with a low needle-like content and almost no internal cracks. 1. Mobile flexibility is the most basic and significant feature of mobile crushing station. The mobile crushing station has a high vehicle chassis, a small turning radius, and is convenient for transportation. It is more conducive to entering the reasonable construction area, eliminating the cumbersome frame structure when crushing, foundation construction, and saving a lot of time. 2. It can provide more flexible process plan configuration according to customers' requirements on material types and products in the process to meet users' requirements on mobile crushing, mobile screening and other requirements. 3. Reduce the cost of material completion, directly select the site, drive to the site, do not need transportation, directly reach the particle size of finished products; In addition, the lengthened unit can more directly send the broken materials to the special belt conveyor, saving transportation costs. 4. The high-performance mobile crushing station is equipped with high crushing efficiency and excellent functional crushing product quality, with light and reasonable structural design and excellent crushing performance. Reliable and stable quality assurance, the largest range of course, medium and fine materials crushing and screening requirements, for the new and old customers at home and abroad to establish a good quality reputation. 5. Environmentally friendly, mobile crushing stations will not cause damage to the environment during production and use, affecting the living environment of human beings. 6. Construction waste can be recycled after being crushed and treated, turning waste into treasure, reducing construction waste disposal costs, and saving energy for the country. It is in line with the country's sustainable development strategy and belongs to a healthy green industry.